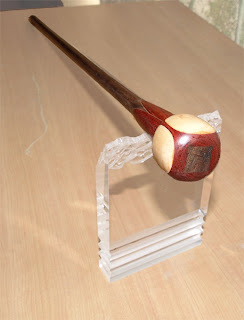 Hand turned wooden walking cane. The mesquite, a rich brown wood, runs all the way through the walking stick to ensure stability and strength. The bloodwood and fiddle back maple serve as a vibrant contrasting accent at the knob. This just sold! And of all things it's going to Australia! There are just two more. . a matched set. . available on Etsy.